I really enjoyed this meal because it was quick and easy! The buttermilk brine really made the pork chops tender and imparted some flavor with fresh herbs. After brining, I rubbed the pork chops with a homemade BBQ rub. The rub is a nice blend of paprika, salt, garlic powder, onion powder, black pepper, and a touch of cayenne. I reduced the amount of cayenne because I didn't want the heat to really overpower the dish... but if you like the heat, add more! The rub mix does make more than you need for the recipe so store in a dry, cool place and use on other cuts or pork or even chicken. The rub works great with vegetables like potatoes and corn too! Combine the Memphis BBQ Rub ingredients in a small bowl and set aside. Combine first 6 ingredients of the brine in a large zip-top plastic bag; shake well to dissolve salt and sugar. Add pork; seal and refrigerate overnight, turning bag occasionally. Remove pork from bag; discard brine. Pat pork dry with a paper towel. 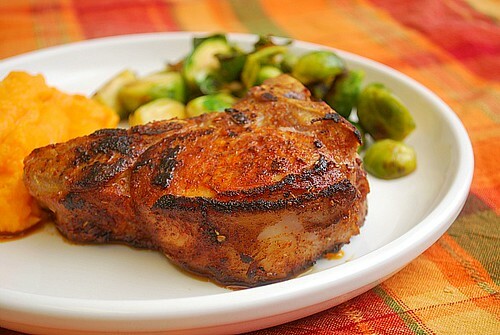 Sprinkle 1 tablespoon of the Memphis BBQ rub over the pork chops. Store remaining rub for future use. Heat a large nonstick grill pan over medium-high heat. Coat the pan with cooking spray. Add pork; cook 3 1/2 minutes on each side or until desired degree of doneness. Yum. The char on that looks gorgeous! Nice job. Just made these for dinner tonight. They were so moist and spicy. I needed to use up extra buttermilk and it was perfect.